As many of you know, whether you call it Grenache or Garnacha, it comes in many different styles and expressions. I've tasted this varietal in many of its forms over the past 12 years, and while I prefer the imported styles from both France and Spain, there's something to be said about Grenache from California as well. It's a region I've dubbed the "Rhone Zone", because of how well the wine bearing grapes of the Rhone Valley perform in the Calcareous soils on the west side of Paso. But, as much as I liken Paso to the Rhone Valley, it has certain similarities to Spain, where the grape is known as Garnacha. 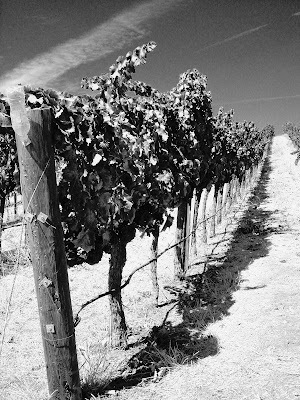 Grenache in the right hands and planted in premium locations can produce complex, herbal, and spicy wines worth short-term cellaring. Because finding that sense of 'balance' is not easily achieved, despite the best efforts of winemakers and growers, Grenache ends up being a blending grape, but again when it's done right, good things happen. While a hot climate is fantastic, it's still a balancing act. If it gets too hot, the grapes become overripe, breaking the brix barrier, then the wine it produces can be insipidly sweet and unappealing. Much like a chubby-ballerina, the sense of balance and finesse is difficult to appreciate. Wine in balance has the proper fruit to acid ratio, judicious use of oak, no discernable flaws, like VA, or aggressive herbaceous notes, etc.. The nose and palate should be similar and in concert with each other, but one intensifying the other. But before you can get to the point where you're producing 'balanced-wines' you need to set in motion the notion of 'balanced-vines.' Of course, I'm not an expert on the subject, but after some research here's something I offer for your consideration on the subject. Achieving vine balance is just as important as the goal of wine balance, and just as accurate whether it's Pinot Noir or Grenache. Now to vine balance, something, as it has been said, is a concept that many wrestle with and argue about how and when it's achieved. So my simple language and inability to fully articulate its meaning will be a poor man's version of a scientific white paper at best, so please bear with me. 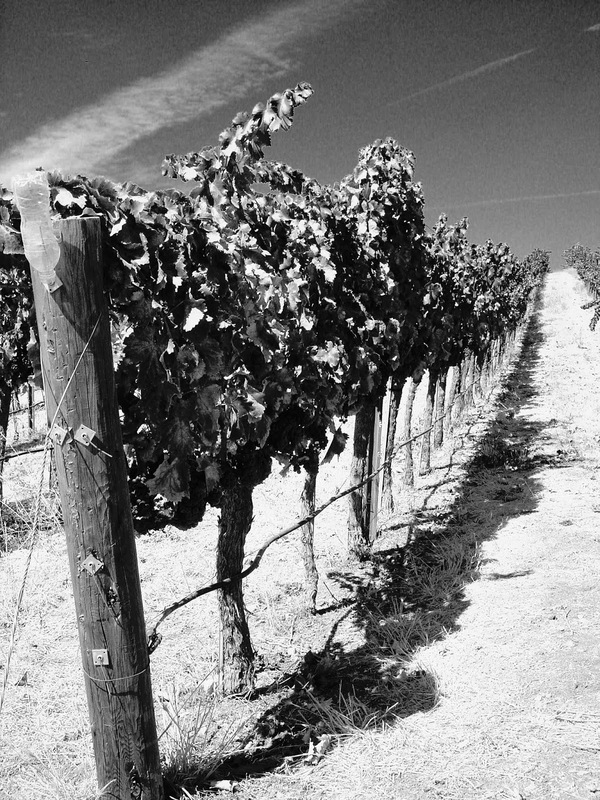 The balanced vineyard should provide proper pruning (one that meets desired outcomes of the buyer) in the dormancy stage; this factor alone could make or break a successful vineyard site. Was the site spur pruned or cane pruned to achieve vine balance, was it the correct course of action? 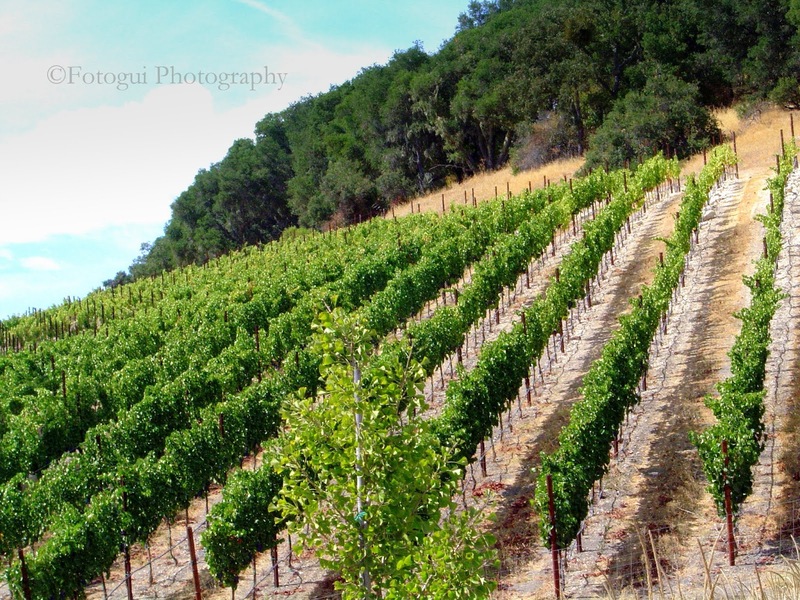 Regarding soil-variability, I read in an article titled "Managing Vineyards" where great emphasis was placed on understanding the role soil plays in vine balance. Controlling vigor during the growing season, thinning, dropping fruit, carefully monitoring plant nutrition, keeping a sharp eye for disease, and other vectors which could inhibit vine balance. Planting the right cover crop during the dormancy stage is also an essential factor. Planting the correct clones and rootstock in the appropriate soil and climate situation also contribute mightily to vine balance. It also entails having the proper fruit zone for which the exact amount of light will help the clusters achieve the desired ripeness levels. The decision to irrigate or dry farm is and will be a factor in the goal of attaining vine balance. Of course, there's also crop load and trellising considerations, which play their part. Hopefully, I elucidated the requisite number of measurable indicators that contribute to vine balance and helped in some small assist in the understanding of the need to achieve both vine balance and balanced wines. That said, it's time to take a look at a couple new world versions of Grenache. Meanwhile, back at the review. Yes, each one of these wines could be labeled as high-alcohol; like the one pictured here sporting a whopping 15% (oh-my) or very near 15%; so save me the crocodile tears and the fits of anguish over the whole, wines are "getting-too-hot" and out of balance nonsense. Each of the following wines I'll be reviewing today sport a balanced approach, even with the high (abv) alcohol by volume. Yes, I'm the kind of wine-guy who likes to gargle with Sauvignon Blanc before heading off to a tasting, and no I didn't swallow. But now that you have that colorful image in your brains (you're welcome) it's time to get down and dirty with one of my favorite grapes, Grenache or Garnacha. I am a 'huge' fan of Grenache and love, love Paso Robles with their incredible wine scene going on there. Now speaking of Herman Story Wines and the gorgeous expression of their Grenache, although it needs a solid decanting in advance to release its full potential. In the glass, this wine expresses an inky dark core, on the nose decadent plummy fruit hits like double barrel action and a hint of well-worn saddle leather comes along for the ride It can come off a bit tight if poured directly from the bottle, so, it bears repeating, please decant first. Even though my palate was fatigued near the end of the tasting I attended, the Herman Story wine shone through the murky haze, and I look forward to grabbing a few bottles for myself to re-sample and enjoy over the years. The texture added weight and has a smooth, round feel. Nose has crushed rocks and floral lavender tones danced to a merry tune. Deep red raspberry flavors with a whiff of orange-liqueur and red and dark fruits on parade. Mouth-watering acidity and firm, but ripe tannins that shorten a what could be a longer finish, but still well balanced; but complexity is not in this wines wheelhouse. Once decanted this wine, it exposed its true self, the paragon of finesse and delight on the palate. The big reveal, what I only suspected could be its real character, what's that you ask? A New World style Grenache showing off ripe cherry, blackberry, tar and smoke with subtle floral framed around the mocha notes, it would do well if it had a place in your cellar and not be open for another year or two. Oh, and btw in case you need a bit of extra persuasion, some guy named Robert Parker really liked it, gave it 93 points and the wine sells for $36, great price for a big wine. 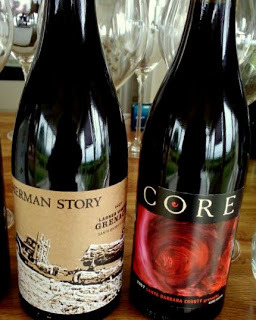 The other Grenache was from Core Winery, a family run winery located in Santa Maria Ca. which is just south of Paso Robles and a bit cooler. Their primary vineyard is the Alta Mesa vineyard, located in Eastern Santa Barbara County and they are selling this wine for about $20 through the wineries website, but most likely it will sell between $14.99 to $16.99 in retail shops. As I'm pouring this wine, it peeked my curiosity, I found to it to be very un-Grenache like, with the appearance and a flavor profile of an over extracted Pinot Noir. This made me wonder, what is the general profile of Grenache, so I looked it up in the Wine Lovers Companion, I found that this style of Grenache is not A-typical at all, instead, in fact, this style is the most common. It was a bit hot, and the RS (residual sugar) seemed to be a little high side, but again consulting my copy of the Wine Lovers Companion, it appears that both high RS and ABV are often part of the equation when it comes to Grenache. Depending on the producers, some tend to be sweet, fruity and low in tannins, while others still can be tannic beasts, seductive, layered sporting real soul and substance. In this review, you see both sides of the Grenache coin, not every producer has the right tools or abilities to work with this grape, but for those who do, the results can be very gratifying for the end user. 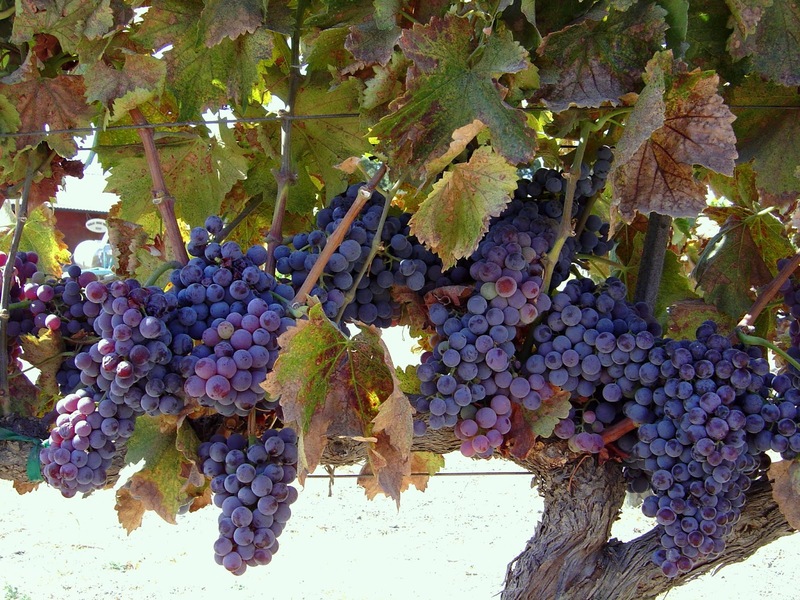 Other Paso Robles producers of Grenache I recommend, Alta Colina, offers a nearly 100% Grenache. They produce a big, dense, layered wine, yet it manages to maintain a sense of elegance and balance. I found there is enough structure under the hood, to evolve for several years and should continue to drink well over the next five to ten years. Their Syrah really takes flight as well, oh my. The views from this property are lovely, you can see Calcareous from there. They have a cozy refurbished wood tasting bar, great wines flying under the radar. Here's a small list of a few others where Grenaches shines brightly. Pithy Little Wine Company: It's a fun tasting experience, while they don't have a single varietal of Grenache, they do produce a GSM (Elephant in the Room) which is out of this world good. Denner Vineyards: The owner Ron Denner is a fun to speak with when he's available. I immensely enjoyed their take on Grenache, they also have a stellar cast of Rhone-Zone favorites and some very nice Cabernet Sauvignon as well, like the Mother of all Exiles. 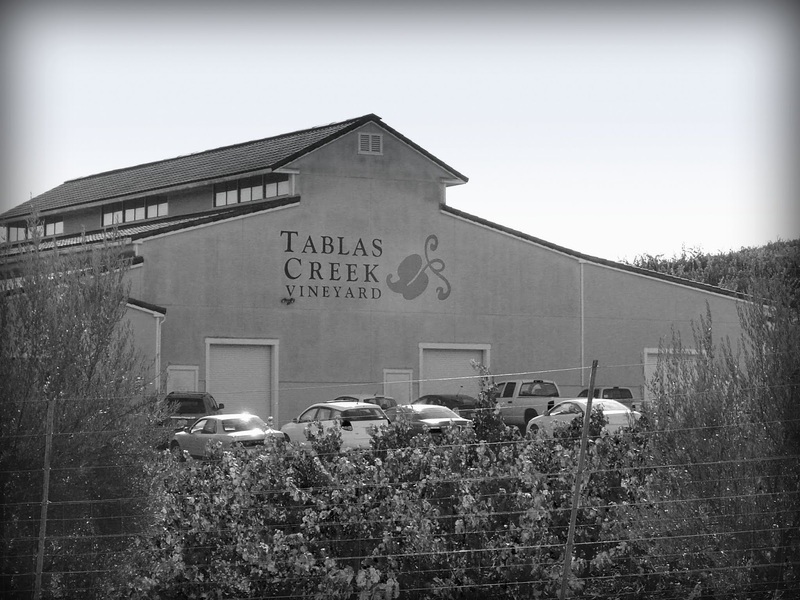 Tablas Creek: So many favorites it's hard to name just one. They have over eight single varietal bottlings to choose from, their Grenache is one of my favorites. Honestly, TC should be your first stop once you arrive in town, and reserve one of their educational tasting options. They set the bar for balanced wines and vines real high. All original content: Including text and photographs remain the copyright © of the author, (W.R. Eyer) and Fotogui Photography except where otherwise noted.